AMOR sculpture by Robert Indiana. 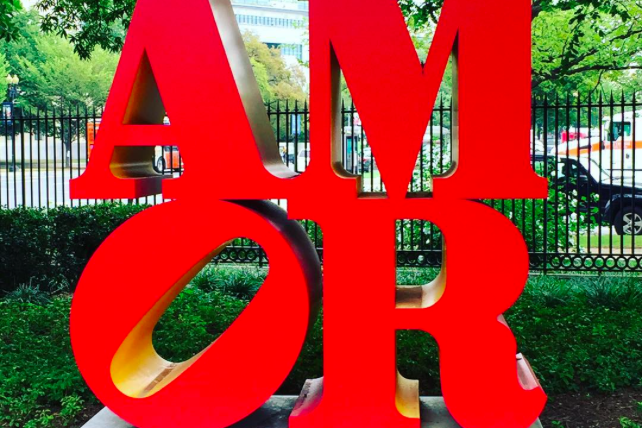 There’s no such thing as too much love, especially in the City of Brotherly Love, and so, the AMOR sculpture is staying put. The Spanish-version piece based on Philadelphia’s iconic LOVE sculpture was on loan to the city for the historic visit by Pope Francis in the fall of 2015. Spanish is the pope’s native language. The AMOR sculpture has been atop the Philadelphia Museum of Art’s steps since the papal visit, and the plan was for it to part ways with the city in spring 2016. But according to an Associated Press report, it's now staying permanently in Philadelphia. On Friday, the piece was set to be relocated and formally dedicated at Sister Cities Park near the Cathedral Basilica of Saints Peter and Paul on Logan Square.